Astronomers used data from NASA/ESA Hubble Space Telescope and NASA’s Chandra X-ray Observatory to observe a galaxy changing its classification twice within five years. The cause of this rare phenomenon is a starving Black Hole at the centre of the galaxy. “Hot and Energetic Universe” the video that AHEAD produced for X-ray Astronomy is now being played in about 20 DOME theater centers around the world and is available in 3 languages (English, German and Japanese). 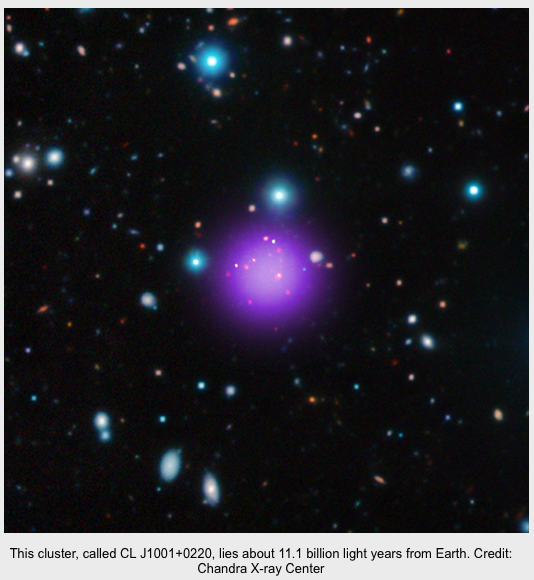 Astrophysicists used Chandra’s X-ray satellite to detect the most distant galaxy cluster ever observed. The galaxy is located about 11.1 billion light years from Earth.